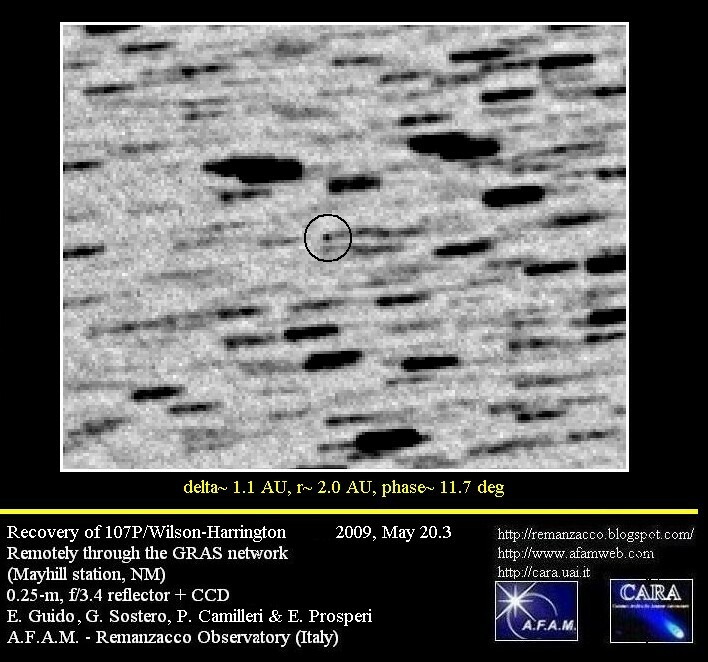 and on 2009, May 21, by means of the 0.61-m f/10 reflector + CCD of the Sierra Stars Observatory, Markleeville (CA). 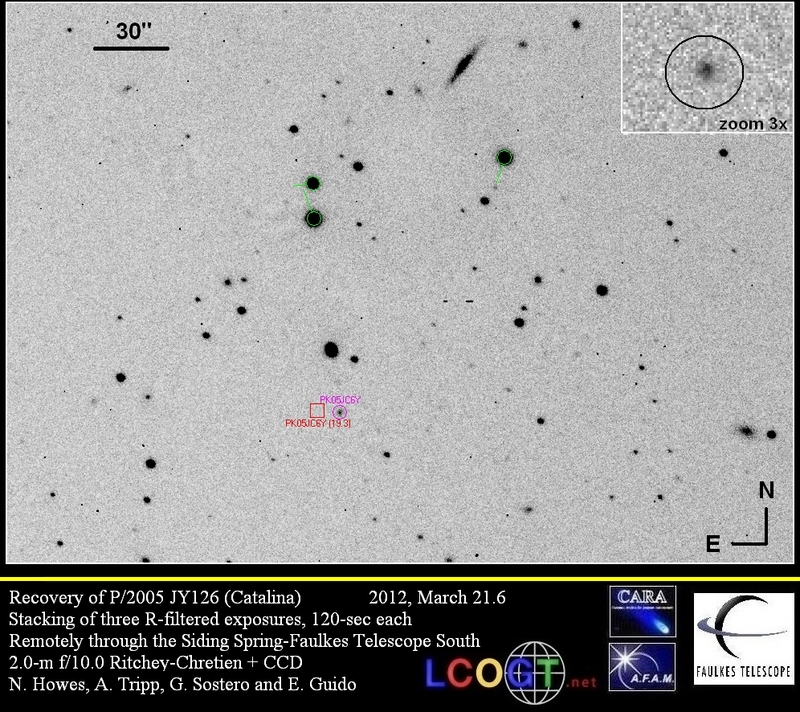 Also in our current stackings, the object appears perfectly stellar, with no trace of any coma or tail. 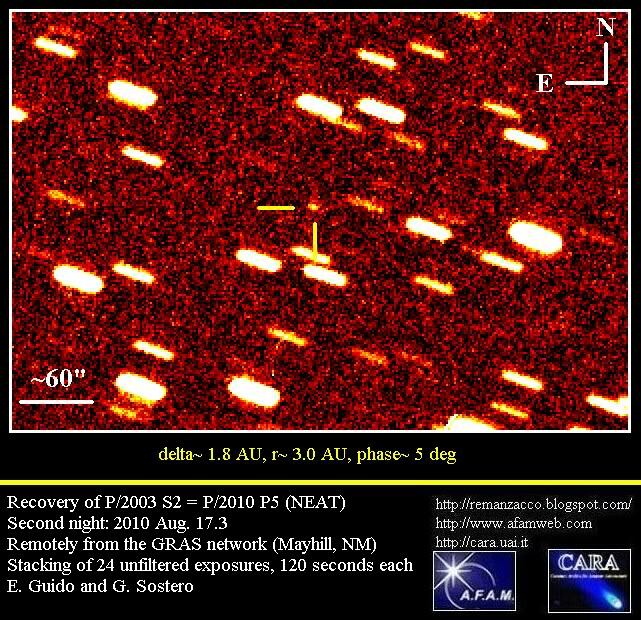 Comet107P/Wilson-Harrington was last observed on 2007, March 13 by the Mt. 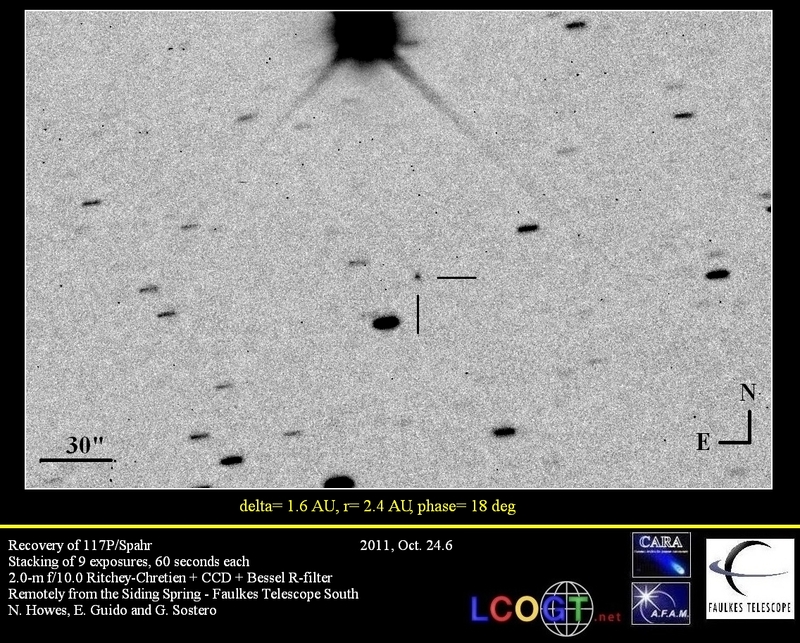 Lemmon Survey. 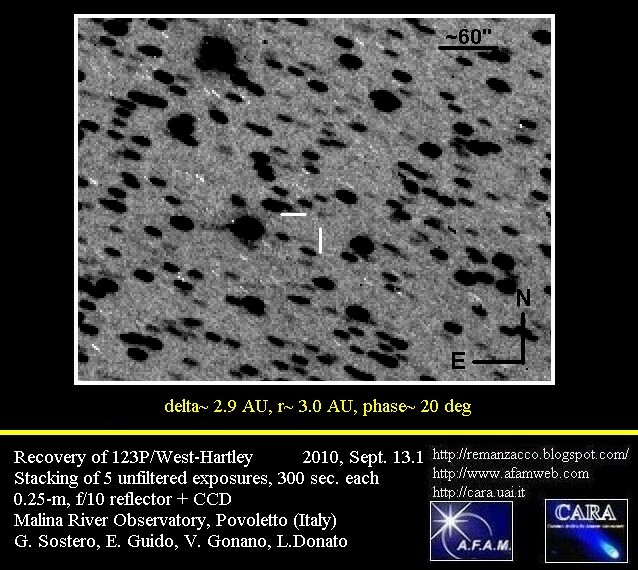 Further follow up performed by the undersigneds with the same instrumental set-up of our previous report (but with 600-sec total integration time) on 2009, May 17.21, shows that the secondary condensation (or knot) that has been reported on comet 19P/Borrelly (see our previous post) has significantly weakened, with an aspect extremely diffuse and elongated compared to our previous observation of May 15.21. On May 17.21 the optocenter (difficult determination) of this feature had a displacement of about 4 arcsec in PA 301 with respect to the central condensation of 19P/Borrelly. 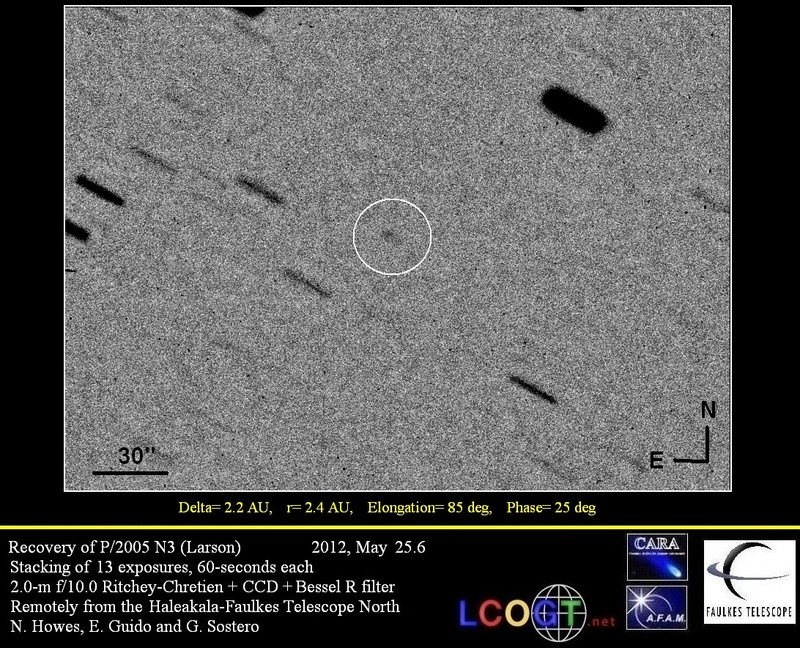 Prompted by an alert note of Bernhard Haeusler, posted in the newsgroup [Comets-ml] on May 11, 2009 about a possible secondary "condensation" in 19P/Borrelly, we performed some follow-up about this comet. 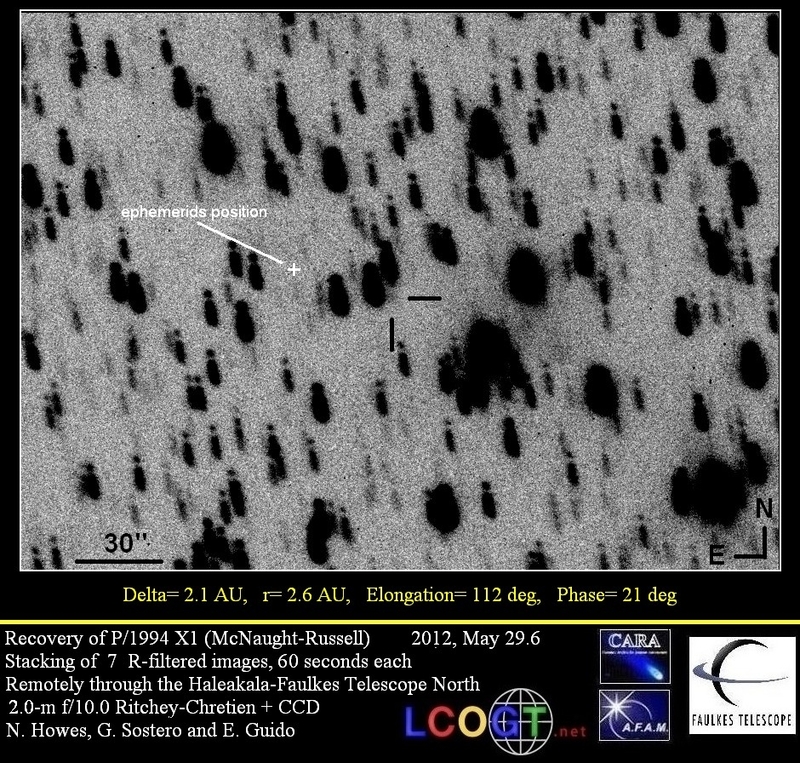 Images obtained by the undersigneds on 2009, May 15.21 with the 0-61-m Cassegrain + CCD of the Sierra Stars Observatory (Maarkleville, CA) confirms the presence of a tailward, diffuse, secondary condensation or "knot", placed about 4.7 arcsec in PA 301 from the primary central condensation. This feature is nearly 1.5 magnitude fainter compared to the central condensation itself. Image processing techniques (azimuthal median subtraction of the inner coma) enhances the visibility of this detail. Comparing the offset data posted in the same blogspot by B. Hausler (May 7: 13 arcsec in PA 310) and F. Kugel (May 10: 8 arcsec PA 305), this feature apparently approaches the central condensation; however some foreshortening effect might be under course, also considering the fact that, on about 2009 June 5th, Earth will cross the orbital plane of this comet. 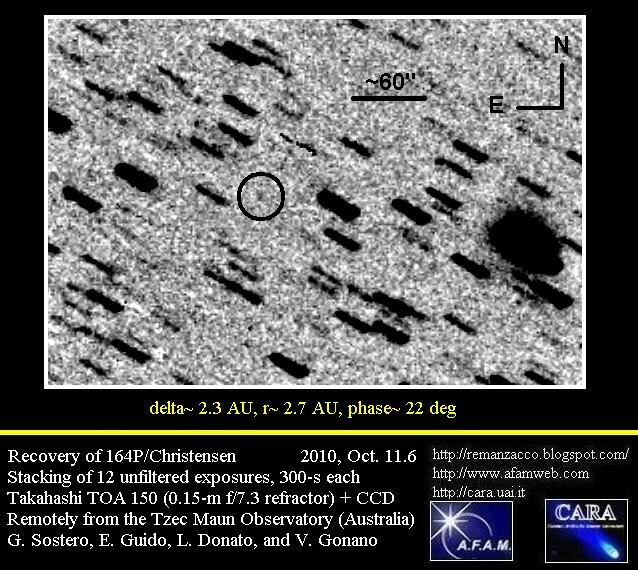 Following an alert note posted today by Grzegorz Pojmanski in the vsnet-alert newsgroup about a possible nova in Cen, on 2009 May. 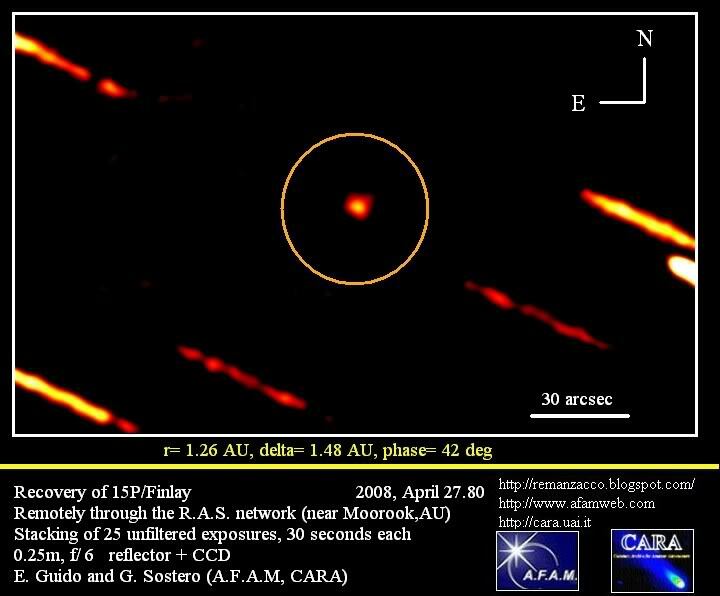 13.57 we performed some follow-up of this object remotely through a 0.25-m, f/6 Ritchey-Chretien + CCD, from the RAS Observatory (Moorook, Australia). R.A. = 13h31m15.77s, Decl. = -63o57'38".6 (equinox 2000.0; UCAC-2 catalogue reference stars). 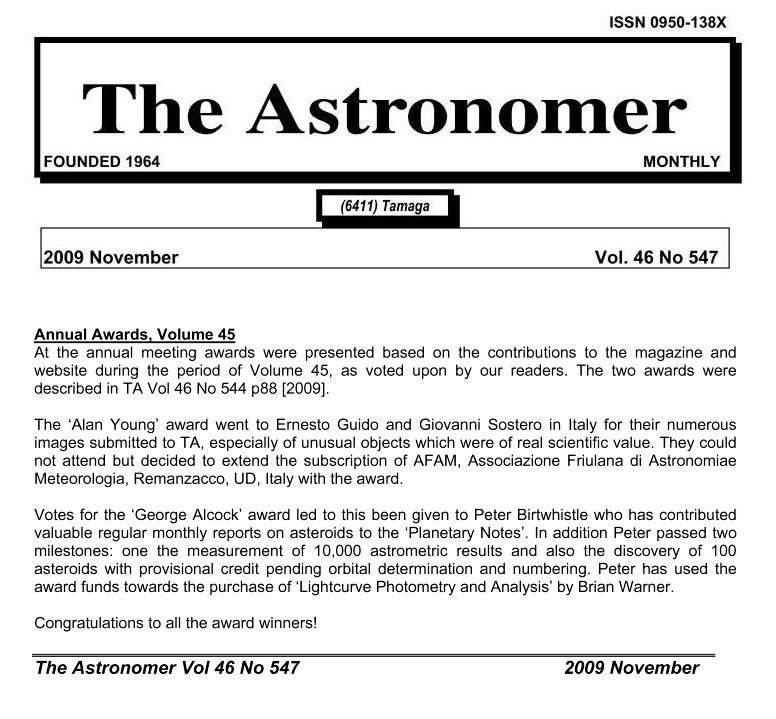 Comparison with an Anglo-Australian Observatory Schmidt red plate (limiting magnitude about 20), obtained on 1997, Feb. 05, show that this position is nearly coincident with a field star, whose position end figures are 15s.68, 38".6, and magnitude about 15 (however, the extreme stellar crowding due to nearby field stars, makes this measurement rather difficult). This nova has been designated V1213 Cen. For more info see also this paper on NATURE. 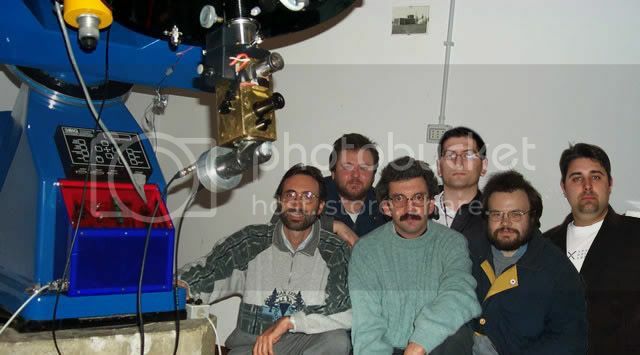 Welcome to our Astronomy blog, devoted in particular to Comets & Asteroids and related topics. 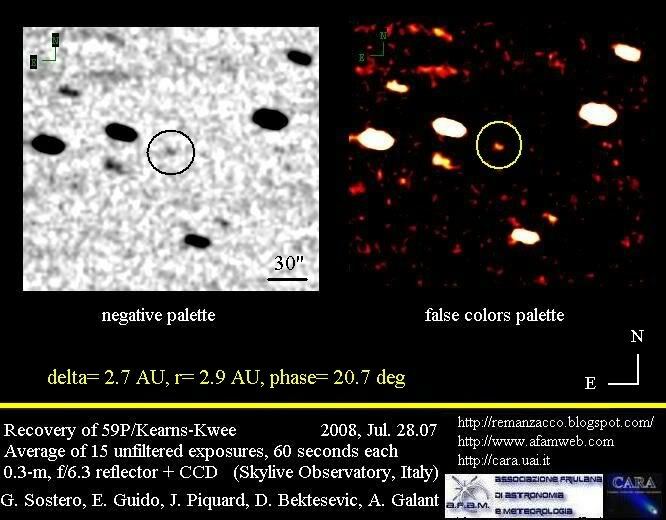 This blog is maintained by Italian amateur astronomer Ernesto Guido, particularly active in the study of the small bodies of the Solar System.